AWT Printing gives graphical components of applications as the output. It is followed in two steps. To perform these actions, classes, interfaces and methods are required. Initially, a job is created for printer. 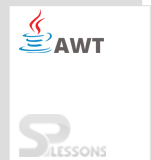 This creation is done by involving classes that are present in java.awt.print package. The printable interface consists of single method only. Now, attach the content to the Printable interface, which implements the code. Then, a dialog box appears requesting to adjust as per the requirement like a number of copies, page setup, and printer selection. If requested to start the printing, the PrinterJob.print() method is called. PageFormat Class class gives the information about size of a page, orientation and imageable area where the content is placed within the borders. This interface is used to print the graphical objects. This is done by calling the getGraphics() method of the PrinterJob through Toolkit. Further, printComponents() method is called before the final paint() method is returned. Sometimes paint() is modified, which defines the context. // These are the methods of the Pageable interface. // that this class must also implement the Printable interface. // figure out the baseline for our font. // We couldn't do this earlier because we needed a Graphics object. // Note that you cannot assume that black is the default color! // Ask the user to select a printer, and if not canceled, print! 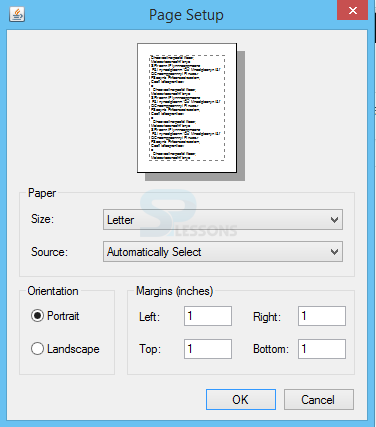 PageFormat Class gives the information about size of a page, orientation and imageable area.